Yesterday was magazine day! 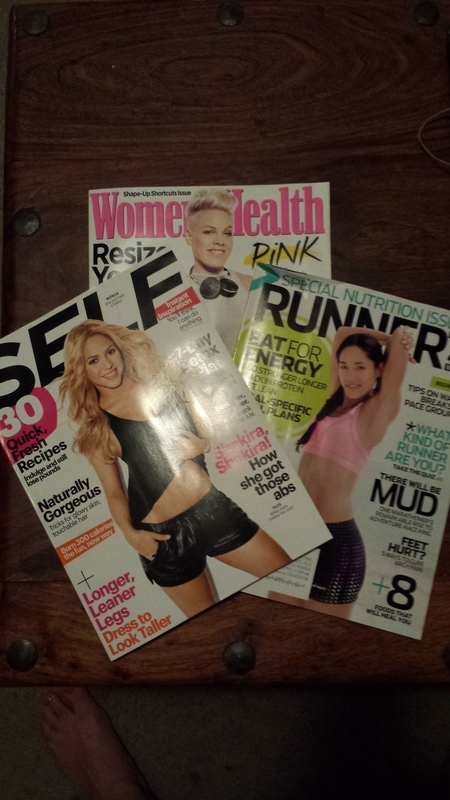 Call me old school, but I love coming home to these glossy pages. Browsing magazines with a glass of wine = ultimate indulgence. Recently, I picked up some chia seeds at Marshalls on the cheap. I tend to be a toe dipper when it comes to the latest healthy food fads, but chia seeds have been calling my name. They’re a great source of omega-3 fatty acids, contain 18% of the daily amount of recommended calcium, and give you super human powers contain a good amount of protein. But don’t take my word for it, Dr. Oz says they rock, so it must be true! 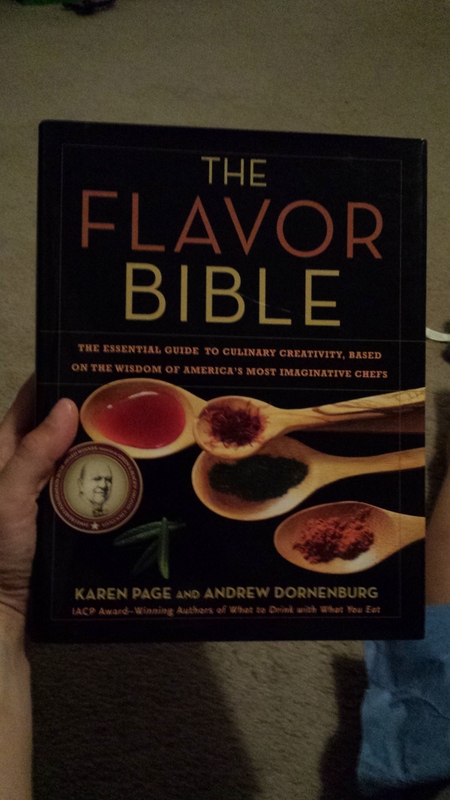 Multi-tasking at it’s finest: researching flavors while icing my knee! 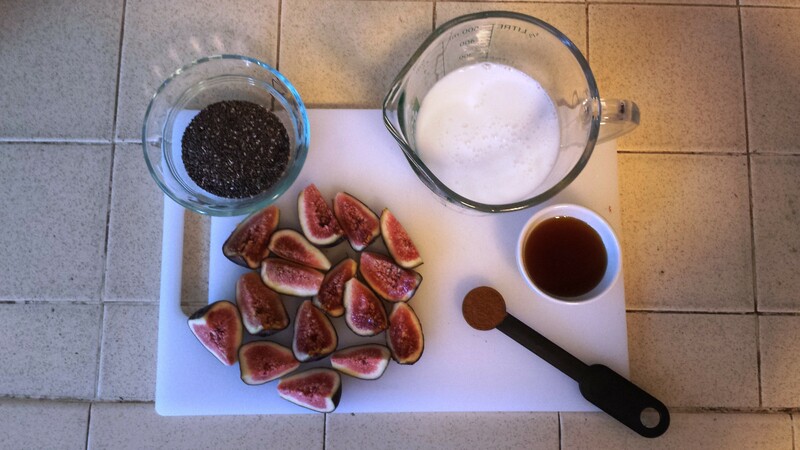 I’ve been having a bit of a flirtation with figs every time I go to the store or farmer’s market. I am not a fan of fig newtons at all, I think they’re pretty gross, but these weird little fruits have been enticing me with their odd shape and murmurs of sweet/savory flavor possibilities. And so, a pudding was formed. Directions: Combine figs and coconut milk and blend until smooth (I used an immersion blender, but either kind would work). Add in the maple syrup in increments, blending and tasting as you go. Some varieties of figs are sweeter than others, so you may need less sweetener in the long run. Add in 1/4 tsp of cinnamon and blend, if desired. This tastes great without the cinnamon, but the aroma of the cinnamon really makes it smell and taste like Fall to me. Once you’ve combined all ingredients and are satisfied with the flavors, add in the chia seeds and blend. Let sit for 5-10 minutes, and stir. Let sit for a few more minutes, stir again. This to avoid the gel-like chia seeds clumping together to create a weird consistency. Once you’ve stirred a few times, let the pudding sit for 30-60 minutes before eating (or overnight if you plan on eating it for breakfast). I stuck mine in the fridge because I love cold pudding, but if you were going to eat it soon, it could also hang out on the counter for a bit. When I was ready to eat, I topped with a bit of toasted walnuts because I love nuts. Serves 2 breakfast-sized portions or 4 small snack-size portions. What’s your favorite flavor of pudding? I love a good home-made banana pudding! And by home-made I mean jello haha. 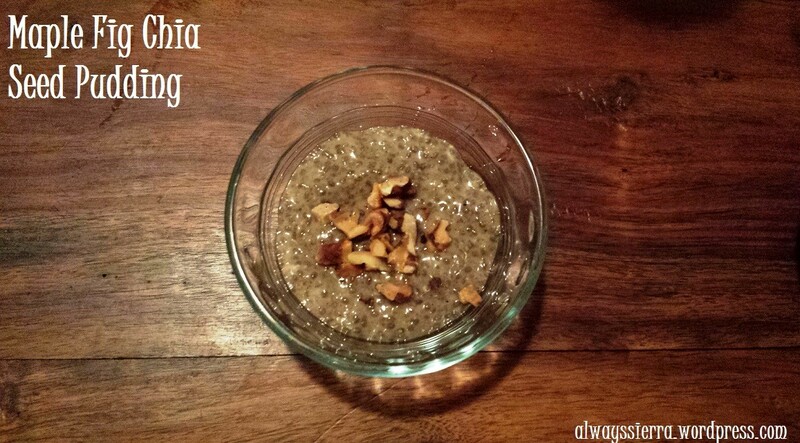 New to making chia seed pudding? Check out this post. This entry was posted in Recipes, Uncategorized and tagged chia seed pudding, healthy recipes, healthy snacks, maple fig chia seed pudding by Sierra. Bookmark the permalink.